Though the cool weather may try to convince you otherwise, Theatre By the Sea has opened its first show for the season, and that should be all the indicator you need that summer is, indeed, on its way to Rhode Island. And while the Matunuck house is boasting several big productions this summer, it’s made a tepid choice in leading with “Ain’t Misbehavin’,” the Fats Waller musical revue. The show features five actors (along with the simply incredible pianist Christopher Davis) in a gorgeous Art Deco bar singing and dancing through some of Waller’s most memorable numbers, including “Honesysuckle Rose,” “Cash for Your Trash” and “The Joint is Jumpin’.” And while some of the songs are difficult to listen to, director Gerry McIntyre’s choreography is excellent, covering a number of styles and flawlessly executed by the entire cast. The cast, it should be noted, go by their own names, which makes sense when you consider there is literally no plot in which you could put characters. There almost no dialogue, just one song after another for around two hours, which may account for the uneven vocal performances delivered by some of the actors. It’s a lot of vocally demanding music and some of the more lackluster moments could be attributed to fatigue. It’s hard to imagine with the amount of talent the equity house pulls every year that McIntyre would deliberately cast someone who couldn’t handle the score from the outset. Regardless, there’s enough in the show to overlook the moments that fall short. NaTonia Monet rocked a couple of her songs but seemed to be unable to project at all in others. Who knows why, but Monet is such a stunning dancer with a look straight out of a Jazz Age painting that it would be a shame to not see her on stage. She does exceptional work when paired with the talented and very funny Jeffrey Eugene Johnson. Johnson, who is the only member of the cast who has acted with TBTS before (including Cogsworth in last season’s Beauty and the Beast), is clearly the show’s dance captain for a reason. His performances are captivating, and his vocal and physical talents are especially highlighted in “The Viper’s Drag,” a song that waxes poetic about the wonders of smoking weed. It’s an exceptional moment in the show. Tarra Connor Jones is blessed with some serious comedic acting skills and an incredible voice. She was a treat to listen to in every number. DeMone takes on a lot of Waller’s big numbers with ease and also has a lot of fun during the number “Your Feet’s Too Big,” which invites some hilarious poking fun of a random audience member. If you’re asked to come on stage, do it! And finally, one of the most well-rounded members of the cast is Helen Marla White, who handles any number effortlessly, has great stage presence and some solid dance skills. She was my favorite to watch for the duration of the show. The vast majority of the numbers are fun, lighthearted and pure entertainment. In Act 2, the cast does take a moment to delve into the serious with the soulful and beautifully harmonized “Black and Blue.” It’s one of the best moments in the entire production that will give you chills. If musical revues aren’t your thing, this one may be a miss for you, but if you’re looking to listen to some old tunes performed on a gorgeous set with some very talented dancers, this is the show for you. If you’re more the traditional musicals type, you’ll probably find yourself frustrated with the lack of through-line and characterization. 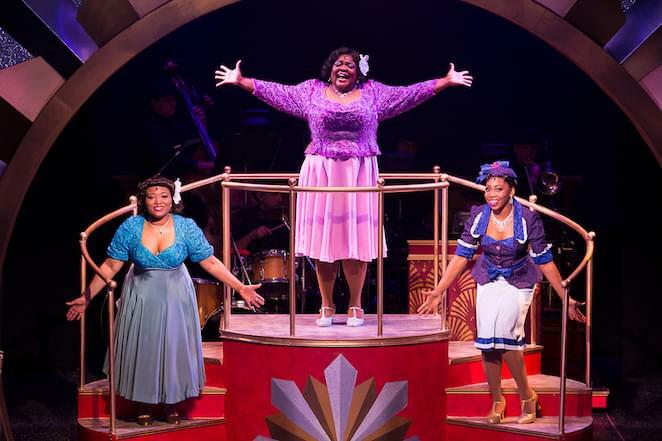 It should be said that “Ain’t Misbehavin’” is decidedly a product of the era in which the music was written, which means some of it will seem out of place in today’s politically correct climate. Whether that’s a deal breaker is up to you. “Ain’t Misbehavin’ ” runs through June 17 at Theater By The Sea, 364 Cards Pond Rd., Wakefield. Tickets start at $52 and may be obtained by calling 401.782.8587, or online at theatrebythesea.com.